What do you loving photographing? Then, I have a handy FREE download for you today. 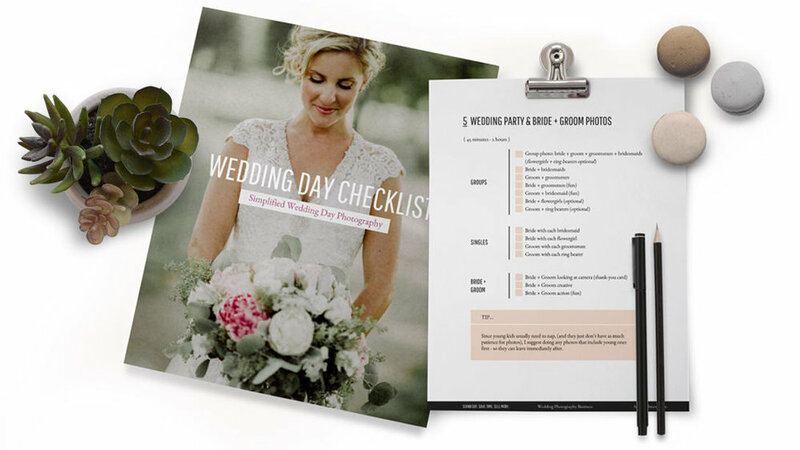 My Wedding Day Photography Checklist simplifies the wedding day events into manageable bite-sized sections. So, if photographing weddings makes you feel stressed, confused, anxious or just down right uncreative, this checklist will help cut through all the excess distractions of the day, and help you to focus on what you should be photographing. And give you ideas if you're drawing a blank. This checklist will help you slow down, so you can get creative with the photos you should be taking. And in my experience, this is a complete index of the core photos that make your brides happy, and curate a complete wedding day story. Everything else you photograph in addition to this list is gravy. So you're happy and your clients are happy. To download your copy click here. knowing how much time you'll need for each part of the day. For example, when your bride asks you how much time you'll need to photograph the her getting ready, you'll know what to say and how to plan. you'll also get some insightful tips on how I approach and handle different parts of the day, to maintain control and keep (everyone's) stress levels low. and more, since it's a checklist, you can easily print it off and bring it along to your weddings. Check off and refer to the list throughout the day, to ensure you've photographed everything you need. Or, if you're drawing a blank, use it to get ideas on what else you could be photographing. and most importantly, it will assist you in anticipating what the next part of the day holds and what you'll need prepare for. Now, we’d love to hear from you. In the comments below, write you why love photographing weddings or why you're resisting photographing them. And let me know what you think of the checklist. P.S. If you know someone who might benefit from this, go ahead and share it with them. P.S.S. My wedding photography e-course program SAVE TIME. STAND OUT. SELL MORE. is opening up soon. For more information and to be the first to know when registration opens (with special savings) click here. I hope you'll join us! Join the community for a free serving of marketing, motivation & sales tips right to your inbox.